*VIBRATO: Italian for Vibrating, a technique used in viola playing. Combining the basics of Scales, and the MUST HAVE basics of making sound, using irresistible games, this powerful, rewarding, step-by-step system of MASTERING Vibrato, will help students gain the tools necessary to express themselves with their music. Written to be used in conjunction with Books 4 and 5 of the Viola Book Series. 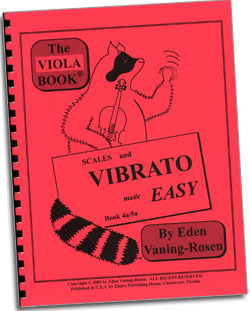 The Scales and Vibrato Made Easy Book is actually a universal book, working equally well with books of any system and with teaching styles of any format. The thorough scale practice section uses detailed metronome charts to speed up scale practice under a controlled format, focuses on tone production as well as accuracy, and adds the elements of theory in an intriguing new style to get the student "involved". This handles the motivation-to-practice problem encountered with some students. There are plenty of brilliant "experiments" for the student to try. The results are that the student actually participates in his scale studies and understands how these apply to him. A Scale is a MUSICAL STEP LADDER, with notes travelling up or down, step-by-step. These are used to warm up the violist before playing. Warming up the muscles is done by performing certain actions at the beginning of each practice session. These actions are repeated over and over daily. Athletes, such as Ice Skaters and Gymnasts, ALWAYS WARM UP as the first part of their practice. How do I get my child to DO his scales? This is not a common problem when using this book. Children can find them boring, especially when their importance is not understood. This book gives brilliant experiments for the student to try. These INTEREST the student. 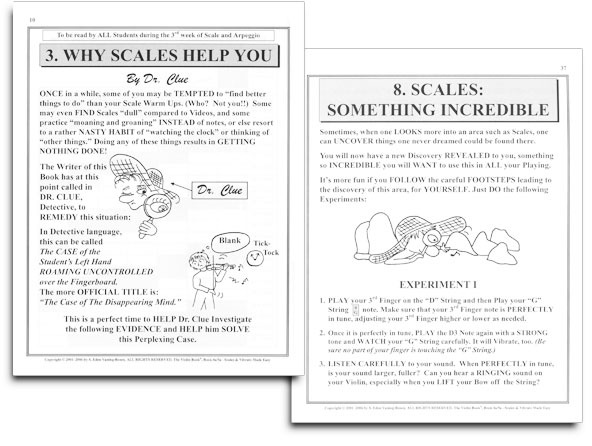 The result is that the student actually participates in his scale studies and understands how these apply to him! Following through experiments to uncover the riddle of Scales, the student turns his interest into the good habits which will serve him for the rest of his Viola playing life. What is Vibrato and why do I care? Vibrato is Italian for Vibrate. This is a very important Viola playing technique. 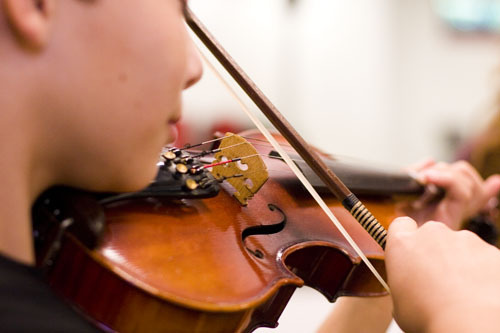 Whether the student gets it right or not will heavily influence all further Viola playing and learning. Taught wrong, the student will have a miserable time trying to play more advanced music. Done right, they will sound like they belong in Carnegie Hall. 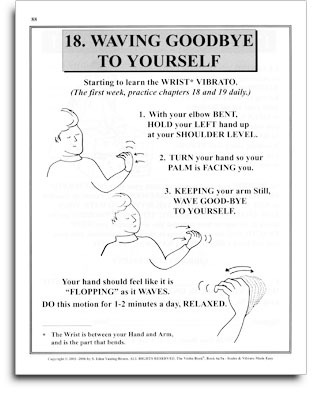 From the simplicity of learning the first basic hand wave, to discovering marvelously "original" ways to isolate and overcome problems so that Vibrato playing comes "alive," the student will master all aspects of learning to Vibrate. "A violaist is going to live with his vibrato for the rest of his life. It is not uncommon for a violist to spend years and years searching for a better vibrato out of dissatisfaction with his present ability to express himself. This book breaks through these problems in such a way that a student CAN command control over an area directly affecting his personal satisfaction with his vibrato performance. The materials are presented with creative brilliance; so simple and yet so powerful." "The uniqueness of this book is its ability to pull together various fields related to vibrato, creating the final product of a solidly taught student having the tools to really express himself. Scales, sympathetic vibrations and Vibrato all add up to 'command of the actions of the left hand.' 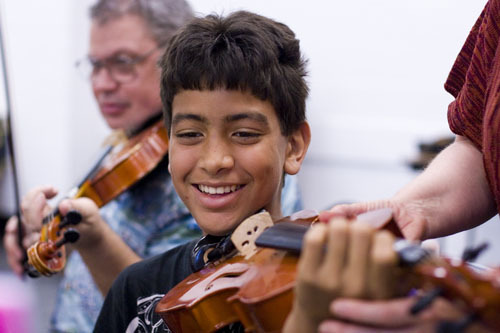 This serves as a tremendous springboard to prepare a student to venture forth into the major literature for the viola." The student will gain a whole palette of Vibrato "colors" from which to choose, and thus have the ability to make personal choices and to be able to achieve his goals in expressing himself through his Vibrato. This Book is filled with new, original solutions which breaks the infamous "Clutch" of the student's left hand (which serves as a major barrier to freedom of Vibrato for many). 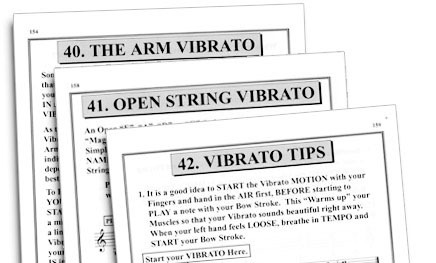 These exercises "break" through the body's resistance to applying new actions by imaginative, refreshing approaches to the traditional problems inherent in Vibrato training. 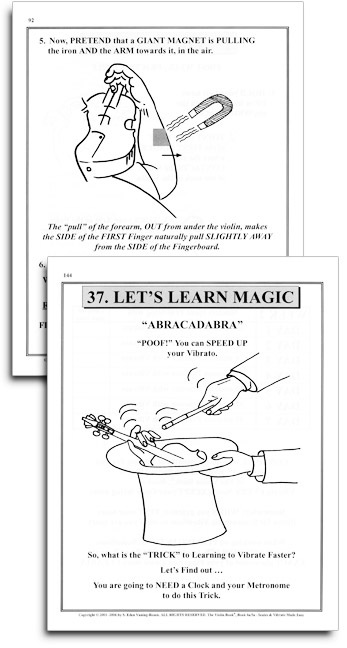 You'll get all the secrets of learning a great vibrato, in this book! I've never heard of Vibrato before. What do I need to know? The thoroughness of the instruction goes into all corners of Vibrato application, leaving the student with an understanding to tackle and master Vibrato throughout the entire range of his repertoire. 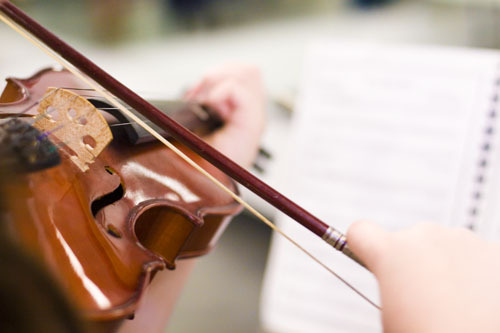 Once Vibrato study is started, it is extremely important that the student learn how to listen, as Vibrato can often hide incorrect intonation and overshadow a host of other problems. The student really digs deep into the field of "Listening" when the world of "Sympathetic Vibrations" comes alive to him. Basics of Science are explained in step by step examples. The student will be utilizing experiences discoverable from life, plus personal observation and games. This creates the awareness necessary to undercut problems in correct sound. Thus, a student's Vibrato is enhanced by being fully understood, eliminating the trial and error which would otherwise train in bad habits. When all the actions integral to playing Vibrato are broken down and completely mastered by the student, the assimilation (or putting together) of the parts becomes extremely effective and doable. The success of achieving a major new ability sparks enthusiasm in a student who can now travel on to greater heights. And what about those folks from other systems who were never satisfied with their vibrato, and now can't change it to create the effects they would like to achieve? There's chapters for them, too - new ways to achieve the results they want.